With the arrival of the all-new Mazda CX-3 at Grieco Mazda of Delray Beach, we wanted to take some time to showcase a few safety features that make this the popular subcompact crossover to own. With the Blind Spot Information system, you'll never have to guess how close another vehicle is to your rear bumper. If a vehicle moves into the blind spots around the Mazda CX-3, your side mirror flashes an alert to warn you to proceed carefully and maintain your lane until clear. You can enjoy all the technology of the new Mazda CX-5 as soon as you get behind the wheel. From safety features to convenience, the popular crossover SUV has a lot to offer. Your goal should always be to drive safely. Mazda works hard to keep you safe by using innovative technology that issues warnings when a collision is likely. You can enjoy blind spot monitoring, lane departure warnings, rear cross traffic alerts, and more. Mazda understands that you need your family vehicle to be equipped with the latest in technological innovation. This is why the Mazda CX-9 is packed with a variety of technology features designed to make both your drive and your life more convenient. The CX-9 experts at Grieco Mazda of Delray Beach welcome the opportunity to show you how this popular 3-row SUV can work for you and all of your automotive needs. Everything that you need is available at your fingertips with the optional Android Auto or Apple CarPlay connectivity. The 2019 Mazda MX-5 Miata is one of the top sports cars in the world, ranked number one by US News & World Report. It scored highly in performance, interior, and safety. It’s also ranked as the number one convertible. It’s also one of the most affordable and fastest sports cars on the road. The two-seater is designed to be fast with incredible handling, amazing acceleration, and an all new engine with more power. The exterior is sleek and sporty with new headlamps, aerodynamic styling, and rear-wheel drive train. 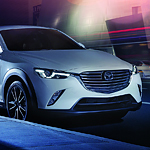 When the new Mazda CX-3 arrived on the lot at Grieco Mazda, we were excited to pass along some information on a few of the technology features that make this subcompact crossover so popular. The Mazda CX-3 is unlike most other crossover vehicles in that you really can create the perfect mood while driving thanks to the BOSE 7-speaker surround sound system. Whether you prefer classical, hard rock, or country, you'll feel like you are in the middle of a live concert with the crispness and clarity of this powerful sound system. When you want to drive a sporty car around town, we’re here to show off the performance features of the Mazda MX-5 Miata RF. At Grieco Mazda of Delray Beach, we’ll show you what the engineers have been able to do to this car. It’s faster and handles better than prior year models. You have many choices for purchasing a new car. Perhaps you want to try a different type of vehicle for the very first time, such as a Mazda, and you don't want to fully invest in a long-term commitment of something brand new. A Mazda Certifed Pre-owned (CPO) vehicle is a very popular choice for that reason, and many others! With the Mazda CPO program, you're ensured the vehicle you choose is high-quality and as close to new as possible to give you the experience you desire. Every vehicle must pass a rigorous 160-point inspection. You may have believed for some time that you needed to choose either to have a vehicle that looks good out on the open road or one that gets good gas mileage. That may be true of other vehicles, but it is not true of the Mazda3 five-door models. The designers of the Mazda3 hatchback have managed to make it a vehicle that gets 37 miles per gallon highway while at the same time maintaining an engine that purrs with power. You actually find both features present in the Mazda3. The Mazda3 Sedan has cutting-edge technology that helps you avoid accidents. Available in three models at Grieco Mazda of Delray Beach, this mid-size sedan starts at just more than $19,000. 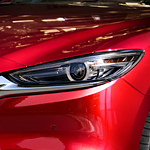 Most of the car's active safety amenities are controlled by the i-ACTIVSENSE system.The Adaptive Front-Lighting System in this Mazda model can automatically alter the projection of light when you make a turn. This advanced lighting system can raise or lower the headlights by up to 15 degrees. Midsize sedans have hit a new peak in popularity. That is exactly why our team of sedan experts at Grieco Mazda of Delray Beach are so excited about the arrival of the brand new 2018 Mazda6 midsize sedan!